We all know that Moto Z has been launched last year, but, the Moto Z is silently changing with a stunning new chipset, without many people knowing. Perhaps this might be a new phone variant with the same look and feel, but not with the specs. 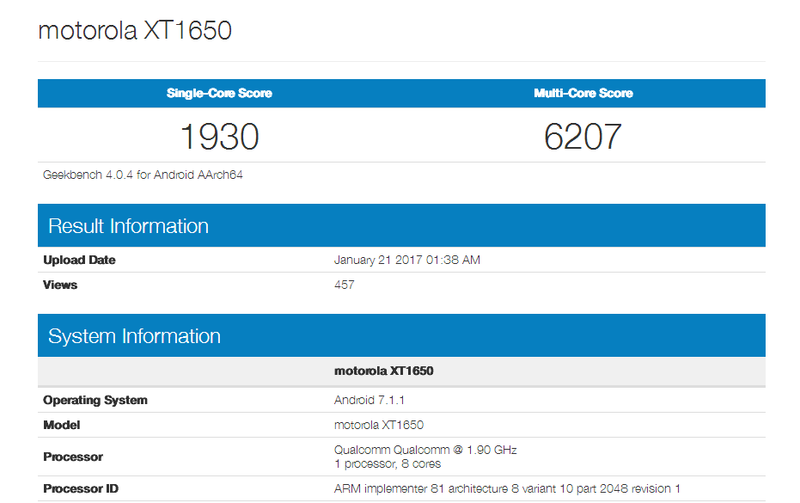 The Motorola XT1650 (Moto Z’s internal product number) has been put through Geekbench tests daily since August 31. You must know it that it runs a Snapdragon 820 quad-core processor. But there’s this one odd run of the XT1650 that happened on January 21 showing it with not just Android 7.1.1 (a Google Pixel and Nexus-only version for the moment), but an octa-core Snapdragon 835 processor and 4GB of RAM. The scores, however, soared up: 1930 for a single-core test, and 6207 for a multi-core one. And it’s just that one instance, because all tests then feature the Snapdragon 820 as usual. The XT1650 name, extends to the Moto Z, Moto Z Force and both of the Moto Z Droid editions (the Moto Z Play is labeled XT1635). So, are we going to have a Moto Z 2017 edition?